Year 2014, as widely anticipated, has truly been an year of beacons. Who would have thought that a bluetooth specification subtly introduced as a keynote in WWDC (World Wide Developers’ Conference) in 2013, would go on to become the most talked about and well documented technology in the days to come. As the year draws to a close, let’s take a look at how beacons have fared in 2014, the year that has seen a lot of ‘hits’ and a few ‘misses’. 1. Innovation in the Beacon Hardware space: If I had to choose one major development in the beacon domain, it would be beacons themselves. Year 2014 saw a plethora of beacon hardware options. Beacon hardware manufacturers kept innovating and improving their products and beacons steadily became ‘smarter’! It all began with the conventional ‘battery-powered’ beacons, that have coin/AA/AAA non-rechargeable batteries that need to be replaced. These were soon followed by ‘USB-powered’ beacons and then ‘ambient electromagnetic wave powered’ beacons. Then came ‘connected’ beacons and ‘cloud’ beacons that could be connected to Wi-Fi. We also saw beacons becoming ‘sturdier’ with ‘all-weather’ beacons, and ‘portable’ with ‘sticker beacons’. The latest entrant is ‘mesh’ beacons – devices that turn the current generation of location-broadcasting beacons into a two-way, net-connected network, by utilizing the capabilities of version 4.1 of Bluetooth. 2. 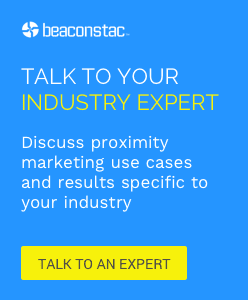 Successful Beacon Deployments: The year saw loads of beacon deployments from – large brands to small and across verticals – from retail to stadiums, museums, hotels and malls to restaurants and casinos. We have already covered almost all of these in our blogs. You may want to check out the following examples to understand more about each of these deployments. i) Macy’s deploys around 4000 beacons across 786 (all) stores in US – such large scale adoption of beacons reiterates the confidence brands have in iBeacon technology and what it can do for businesses. ii) Nivea’s bluetooth-enabled wrist band for safety of children on the beach. This widely acclaimed use of beacons – not for selling a product but to help safeguard kids showed the potential beacons have! iii) Alex and Ani used beacons to optimize store layouts and product placement. Contrary to popular belief that beacons are only for ‘pushing’ ads, beacons can be used to capture analytics and enhance store layouts for better business. Apart from these, Japan Airlines’ use of beacons to improve business processes at the airport, Lord and Taylor’s implementation of beacons across 130 stores, Hillshire Brands’ success – they saw a 20% increase in ‘purchase intent’ of its sausages, Major League Baseball’s implementation of beacons across 20 ballparks and many more such beacon deployments saw the media go abuzz with what these devices are capable of. A few brands struggled with beacons in 2014 due to lack of awareness on how to use beacons. With quite a few privacy and security concerns around beacons, it’s even more important that brands make customers understand that their beacon campaigns will add value to customers’ experience with them. Most brands got tempted to push as many ‘offers’ and ‘discounts’ as possible and made the customers’ experience with them ‘annoying’ instead of being ‘engaging’. This leads us to the next miss. i) New York City phone booths is a perfect example of annoying usage of beacons. In early October, approximately 500 advertising beacons were found installed in phone booths across Manhattan without the consent of New Yorkers. ii) Arts Centre Melbourne used beacons to promote its cafes and bars. The problem here was that the Arts centre tried to replicate a retail approach to a cultural arena. Visitors did not seem to like the approach much and lead to low redemption rates of coupons sent by the arts centre. Beacon Ad Networks: Year 2014, saw the introduction of Beacon Ad Networks, where brands collaborated with a third party app to deliver messages to customers. Though, it solves one major problem owning an app with enough downloads, it provides for little more than ‘blanket’ marketing. Unaware of how to launch their own beacon campaigns, this is one option most brands are considering today. One factor that most businesses miss out on, however, is that the ownership of content and experience lies in the hands of the network and not the business. By using Beacon Ad Networks, not only does the business lose out on the chance to personalize content, to learn from their visitors’ behaviour and use such insights to strengthen their sales, but also end up bombarding their users with unnecessary notifications. Samsung’s Proximity Platform: Samsung entered the Bluetooth Low Energy (BLE) location-based marketing sphere by launching its own location-based mobile marketing platform called Proximity. The platform provides an uber-application, Proximity Service app that sits at the device layer and helps detect a shared registry of beacons and then pushes messages through a shared service, thus cutting out the need for customers to download each brand-specific app. Thus, 2014 has been an eventful year for beacons and looking at the way things are moving, 2015 will be a big year for beacons – with lot more implementations, more clarity on effective usage of beacons, innovation in beacon hardware and more interesting beacon interactions. As we always say, the opportunities are endless and the game has just begun!